After working with this fabric for hours, I decided that I was making a huge mistake. And when I tried on the dress for the first time Sunday afternoon, I was about to cry. Note to self: do not try anything on when you look terrible. 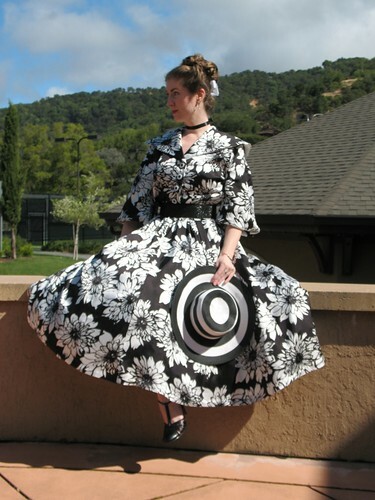 And if the dress needs a petticoat, for goodness sake, put one on because it will make all the difference! I looked like some horrible 1980s black and white blob. No, no, no! Thankfully (at least in this case) I am stubborn, and decided I would finish the darn thing anyway. My bad mood may have had something to do with an email that arrived two days prior, informing the event volunteers (that’s me) to wear khaki or white pants. For anyone else, this would be a relief. Well, you may already be able to guess my dilemma: I do not own a pair of khaki pants. Well, I probably have a pair at the bottom of some drawer, but I did not feel like calling in the bloodhounds, as any pants that might be resting in peace are probably some pleated monstrosity with pegged legs from the early 1990s, and they need to stay exactly where they are. Besides, I had already planned my outfit, and, well, that stubborn personality was rearing its unattractive head. After a quick email, it was clear that I would be allowed a bit of leeway in regards to my choice of clothing. I think that the “wear khaki or white - no jeans or shorts” rule applied more to those who were golfing during the day, anyway. 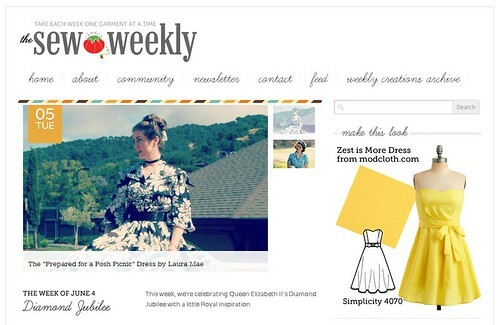 The theme for this week’s Sew Weekly challenge was The Diamond Jubilee. I looked to the past for inspiration, and my new favorite pattern was a perfect match. 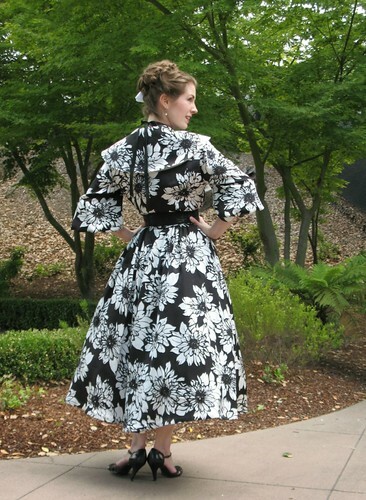 The original plan for this dress was to make a white satin belt. But, once again, time was the enemy. So I pulled out one of my handy beaded belts from my lucky birthday thrifting adventure. And I believe I like the black contrast more than I would have liked the white. So, thank you 24 hour day for keeping me from my original plans. I also had envisioned wearing a large white flower in my hair. But once I put the dress on, I decided it was going to be way too much. Thank you, Sarah Jessica Parker, for the brooch in the hair idea. There was even a bagpiper performing at the event, so I snapped a quick photo - for a moment there, I felt like Fiona in Brigadoon! 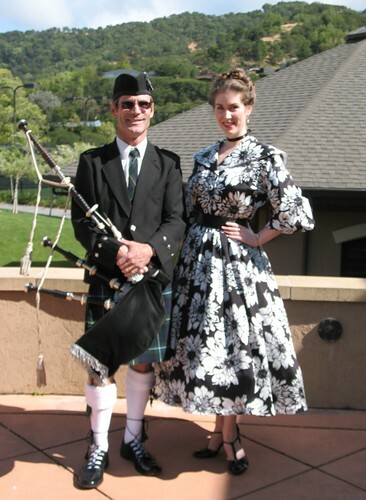 And that kilt reminds me, I think I may have to make myself a pleated plaid skirt this Fall. One of these days a successfully finished project may slake my sewing appetite, but for the moment, finishing a dress makes me want to get all of those ideas floating around in my head worked out in fabric, and ready to wear! More construction details may be found here. I was so looking forward to the big reveal, Laura Mae. The dress is wonderful and I am SO proud to have been the catalyst. Brava!! Laura, the dress turned out beautifully, and you look absolutely stunning! I bet you were "all the talk" at the event (ps love the shoes, too,). Peter, thanks for getting her started. What a stunning dress! And with your styling, it looks ever better. The dress is beautiful and you look stunning in it! "THAT DRESS! Is it real?" "Well, if it had to appear once in one hundred years, it would be when WE'RE looking." "That would NEVER have happened if Cathy Lane weren't on bed rest." 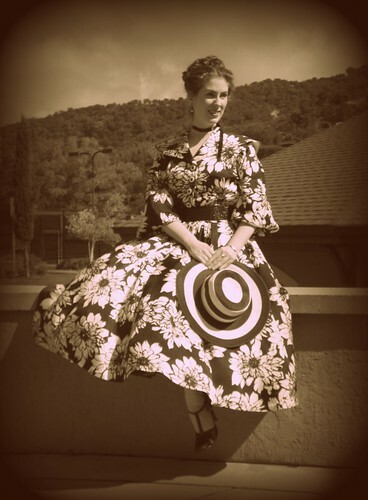 (spoken rapidly) "Laura Mae is no slouch, she has the timing of jackal, the social graces of a debutante, and she knows the sewist's pinky shake - pattern swapping." "Mmm hmm. So a New Yorker comes hither and, blithely oblivious, is fueling her fire." "Could be both with him. All I know is that they're conspiring." "More than that, they're in cahoots." "Thick as thieves; she's quick to steal the show and he's quicker to take a bow." "So they've formed an alliance, did they? How long can that last? At most, a single day." "It looks more like they have formed some sort of trinity, if you ask me." (pfft) "You mean Aunt Marti?" "Ya. That one wanders out of the mist every now and again, as if on cue." "'Treachery without a tail' needs neither a beckon, nor a door." "What WE need is some large floral print fabric." "To the lawn furniture! Let our scissors be our swords." "And, in a suburban miracle..."
(with hands sliding down ribs to hips) "Pin to me, mold to me." "...our own dresses shall appear!" My dear, it certainly sounds like you've had a bit of a rough/stressful spell recently, and am very sorry about that, but am so glad you didn't give up on the dress. 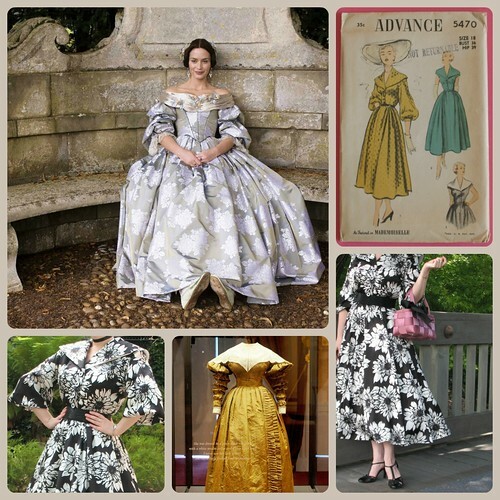 You picked the perfect pattern in the end to pair with this bold, beautiful fabric and both you and the finished dress couldn't look any lovelier. Beautiful! Your work is wonderful! 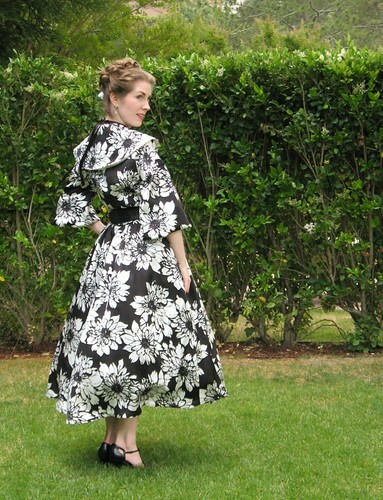 I'm late to the garden party, but I just had to tell you I love this dress, and it looks so good on you. Your first post I was doubting whether the material would look good in the dress, but it does. You have great vision.